My most popular post is easily my voip.ms setup description. Two parts of it that I've had requests for clarification on are the IVRs (Interactive Voice Response) and Callbacks. To help people wanting to set those up in their own voip.ms instances, I've decided to post screenshots of my own configuration. This first image, "IVR Configuration", shows the IVR I created (under "DID Numbers -> Digital Receiptionist (IVR)"). This IVR gets used whenever a Caller ID-blocked number calls me, or someone from a particular area code calls. The person calling is presented with a voice menu, which is a clip of me saying: "Press 1 if you are not a telemarketer, press 2 if you are a telemarketer". If they press 1, then my home phone rings. If they press 2, the system instantly hangs up on them. That seems simplistic, and you might ask if anyone would ever press 2. What actually happens with most telemarketers is that they use an automated computer system to call, and the call gets passed to their operator a few seconds after their target picks-up the phone. This means that the recording is usually played while their computer is doing the transfer, and the telemarkter never hears it. They just sit there on the phone, waiting, not knowing they have to press a button to get to me. They eventually hang up, and my phone never rings. The only trick is the "Recording" selection near the top. You have to first upload a voice recording from "DID Numbers -> Recordings", and then you can choose that voice recording on this screen. The second image, "Caller ID filter", is where the IVR actually gets used. It's created by going to "DID Numbers -> Caller ID Filter", and selecting "Click here to create a new filtering rule". What you can see is that for this filter to get run, the area code has to match 406. When it does, the Routing option tells it to go to the "Possible Telemarketer" IVR we created in the first image. I have a few identical versions of this filter, one for each area code I'm wary of, and one to intercept all "Anonymous CallerID number" calls. The third image, "Callback", is where I create the Callback entry for cheap long distance calls from my cellphone (found under "DID Numbers -> Callback"). I have two such entries, and the one you're looking at here is "Long distance J". In the "Number to call" field you put your cell phone number, or whatever number you want voip.ms to callback to. Please see my original voip.ms blog post for a full description of what the Callbacks are for. To actually make use of this callback, see the fourth image, "DID Settings". 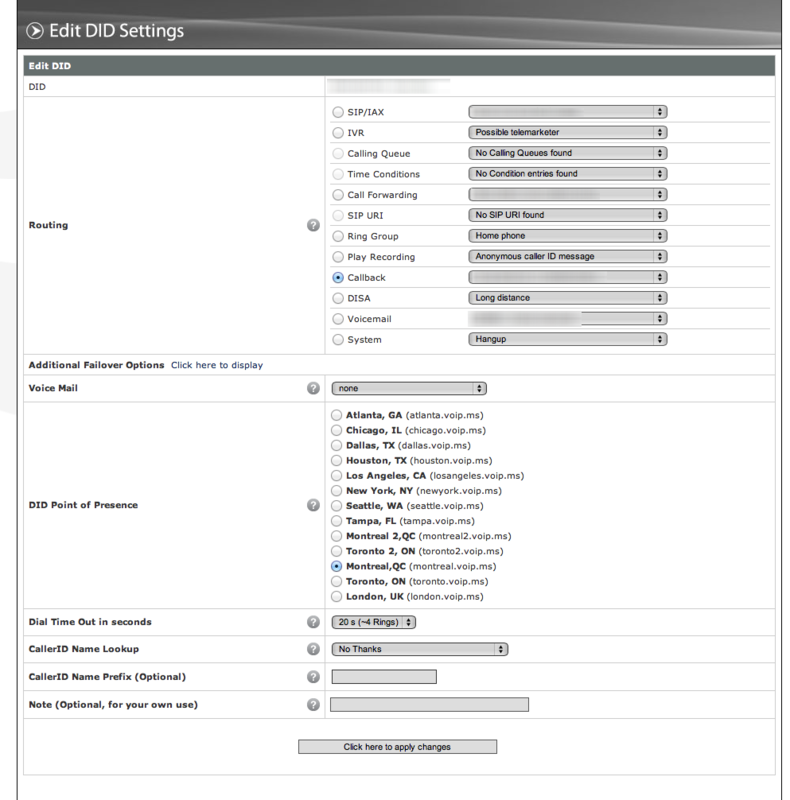 You get to these settings by going to "DID Numbers -> Manage DIDs". It's blurred out, but the first entry in this table, DID, is the phone number I bought from voip.ms specifically for these callbacks (I call it the "secondary number" in my original post). Whenever that number gets called, it will look at the "Routing" table, and see that it's supposed to use the "Callback". That's also blurred out, but it's the callback I configured above. The only potential problem with the callbacks is that if *anyone, anywhere* calls the callback number, then voip.ms will call my cellphone with the callback. I've never actually had this happen though. Ideally, voip.ms would offer a filter that lets you block EVERY number from calling a DID except for one number, but they don't have that. I hope this brief explanation and set of screen shots is able to help people more quickly get IVRs and Callbacks configured for themselves. As always, please contact me if there are any questions about it.